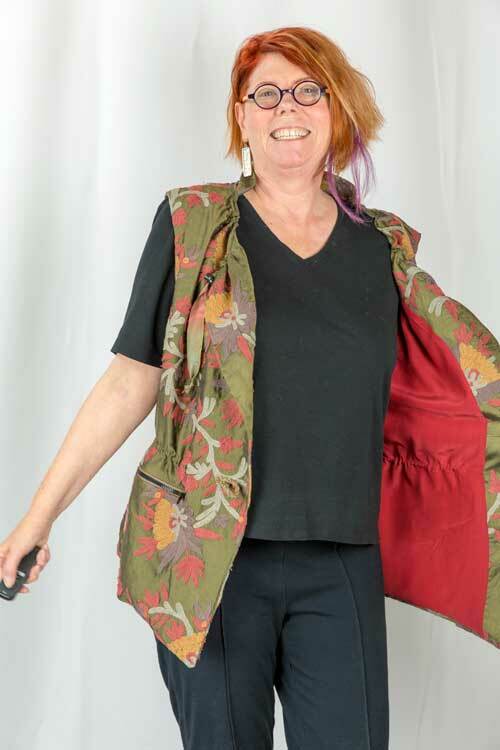 I’ve been holding off blogging about this vest because it is almost done. Yes, I made a mistake, which I’m prone to do more often than I admit on this blog! It’s not a big deal and I have an interesting fix in mind, but I had photographed it before I realized the problem. So here is the vest just the way it is, and yes I can wear it this way. If I have time to fix the mistake, I’ll re-blog the fix. In the meantime the only hint is that the collar isn’t correct. 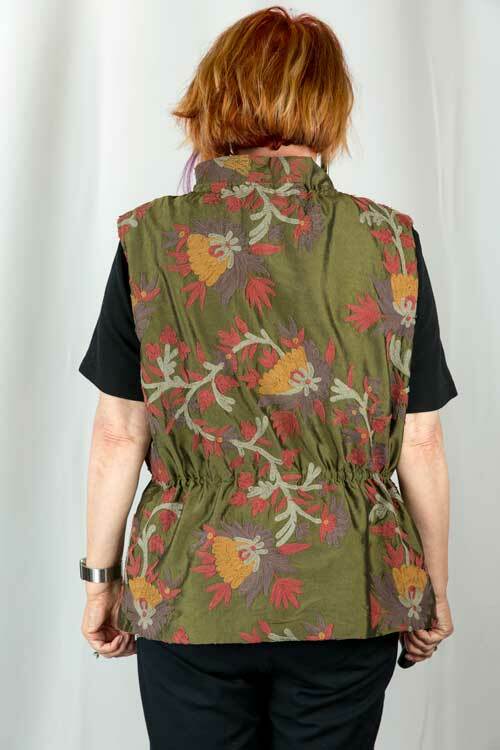 The khaki color reminded me of a safari vest, but I think embroidered silk is a fun replacement for canvas. The lining is the mat side of a red silk charmeuse. Both fabrics are from the fabulous Elfriede’s Fabrics in Boulder, Colorado. I used Kwik Sew #3930 as the base pattern. I like the ties at the neck, but wanted a button at the waist. 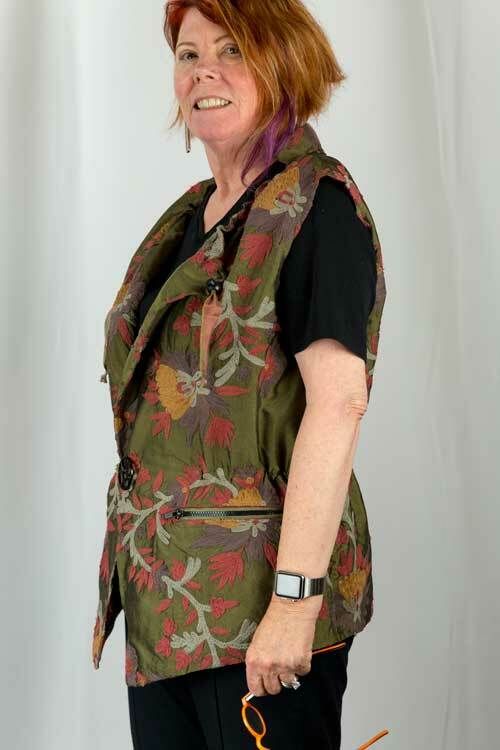 To keep the gathered waist, lining the vest allowed for a casing between the fashion fabric and the lining with a bit of ribbon and a piece of elastic for comfort. The zipper pocket detail from the Moto Jacket replaced the patch pockets giving me another safe spot for valuables or just glasses and lip gloss. Of course, I need a scarf or two for stylish Paris. On the internet, I noticed a scarf with a hidden pocket for travel. Oooh! good idea! My BSF and I got together and made one, and then I made a second one today. These fabrics coordinate with my travel wardrobe so they should look great with my outfits. See that little white piece of paper sticking out of the scarf on the left side? That’s where the pocket is. Pretty handy place to keep that extra stash of important stuff. A cozy knit will feel good against the skin for this second scarf. The fabric is left over from my two recent 45-minute turtlenecks. Now you see it, now you don’t! Simply add an invisible zipper to the first side seam while sewing up the scarf. Above is the open zipper and the two pieces of fabric that will turn into the pockets. Then I just finish the tube up with a twist to make an infinity scarf. Two scarves should be plenty, however I have yet to do a travel mock-up of my outfits. The next week should include some sewing and some planning to find where the missing pieces are. There is still time to sew another piece or two! 5 weeks and 4 days to Paris and Rome!